Which place would be better to show Jugger to the Vikings than a big Metal festival? We had the honour to invite German teams for a Jugger presentation, and a mini-tounament thereafter, at Metallsvenskan: A Metal festival in the city of Örebro, right the heart of Sweden, with about 10.000 Heavy Metallers. And yes, we all had a very good time indeed! Watch the clip, thanks to James and Sindy, to gain an impression. 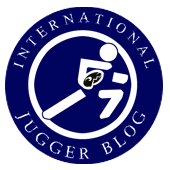 and if you happen to live in Sweden (and also if not), just come over to jugger.se (see here for their facebook page) and start up your team!